Erdogan will begin a new five-year term as president that will see changes to the Turkish constitution, which were implemented after Erdogan's faction, the Justice and Development Party (AKP), narrowly won a referendum last year. The president will be given vast executive powers, including the authority to appoint top public officials and a vice president, according to BBC News. The office of prime minister will be eliminated, and many of parliament’s powers are transferred to Erdogan. He will also be given the opportunity to run for a third term, meaning he could stay in power until 2028. Erdogan gave a victory address from a balcony in Ankara in the early hours of Monday morning, CNN reported. "The winners of the June 24 elections are Turkey, the Turkish nation, sufferers of our region and all oppressed (people) of the world," Erdogan said. 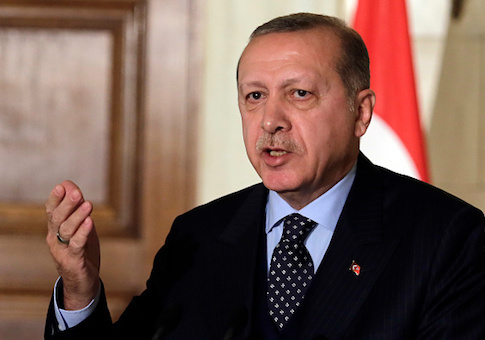 Critics claimed Erdogan used unfair campaign tactics to win re-election. He has silenced opponents and jailed approximately 160,000 people throughout his presidency. Turkey has also been named the world’s worst jailer of journalists with 73 reporters behind bars in 2017. Erdogan managed to remain in power after a failed military coup in 2016 that sought to unseat the AKP from its rule. Erdogan responded by arresting over 50,000 people, firing tens of thousands of government workers and hushing the media. He declared a three-month state of emergency that has been extended seven times over the course of almost two years. After conceding defeat, Ince called Erdogan’s re-election "unjust" and warned citizens that the country was heading into a treacherous period of one-man rule, according to ABC News. Erdongan, meanwhile, spoke about the work he plans to do to make Turkey's economy one of the strongest in the world. "There is no stopping for us until we bring Turkey, which we saved from plotters, coupists and political and economic hit men, street gangs and terrorist organizations, to among the top 10 economies in the world," Erdogan said. But Turkey’s currency, the lira, has plummeted since the failed coup attempt. The central bank has increased interest rates to 18 percent to curb the falling value of the lira, and Erdogan even stated he wants more control over the economy. Weary international investors have fled the country amid concerns of Turkey’s unstable financial situation. Despite the controversies surrounding Erdogan’s win, many foreign leaders congratulated the incumbent on a successful re-election bid, according to the Daily Sabah, a Turkish pro-government newspaper. Russian President Vladimir Putin called Erdogan on Monday to congratulate him on his victory and discuss strengthening ties between the two nations. Other leaders who commended the Turkish leader include Greek Prime Minister Alexis Tsipras and German President Frank-Walter Steinmeier. Erdogan’s re-election is bound to further complicate the NATO alliance as he vowed to continue to "liberate Syrian lands" in his victory speech. Erdogan considers many Kurdish groups to be terrorist organizations, and the Turkish army has conducted military operations on Kurdish forces in northwest Syria since January. The United States supports some Kurdish groups in Syria and claims Turkey’s operations have allowed ISIS to strengthen and reassemble in parts of the region. This entry was posted in Politics and tagged NATO, Recep Tayyip Erdogan, Turkey. Bookmark the permalink.